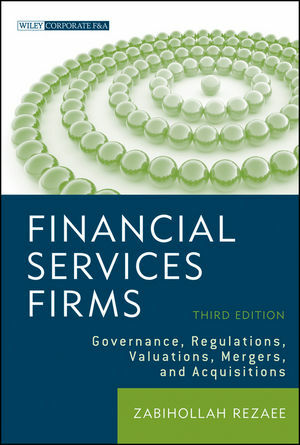 Financial Institutions, Valuations, Mergers and Acquisitions, Third Edition presents a new regulatory framework for financial institutions in the post-bailout era. Over the past decade, substantial changes have taken place in the structure and range of products and services provided by the financial services industry. Get current coverage of these changes that have transformed both traditional organizations such as banks, thrifts, and insurance companies, as well as securities providers, asset management companies and financial holding companies with the up-to-the-minute coverage found in Financial Institutions, Valuations, Mergers and Acquisitions, Third Edition. ZABIHOLLAH REZAEE, PhD, CPA, CFE, CMA, CIA, CGFM, is the Thompson-Hill Chair of Excellence and Professor of Accountancy at the University of Memphis and has served a two-year term on the Standing Advisory Group (SAG) of the PCAOB. He is a prolific writer, having published six books and 190 articles in a variety of accounting and business journals.